Combo package for Compost bin,Rain barrels,compost thermometer, compost turner and compost bin plastic Mesh Bottom Base. Compost Happens "The Free Garden EARTH compost bin is an efficient, durable, and economical tool that saves money and provides many benefits for homeowners and gardeners. Manufactured of 100% recycled content, its single-unit main body construction means no difficult assembly, and no structural integrity issues over time or in extreme weather conditions. The animal and pest resistant lid twists for variable ventilation control, and covers a large 19.5 (49.5 cm)opening that offers easy, generous access to add material and maintain the pile. With the PM-2500 universal mobile base, it's never been easier to move equipment around a crowded shop. This fully adjustable mobile base features side rails and corner pieces with holes spaced every inch to insure the perfect fit for your machine. Move band saws, table saws, sanders, drill presses, jointers, planers and much more. You'll be able to open up space for more effective productivity, better organization, and added convenience during cleanup. The base is sturdy and easy to assemble, and adjusts to fit virtually any large woodworking machine. The heavy-duty steel foot-operated levers lock machines to the floor during use and are ultra-easy to activate for mobility. The PM-2500 has a maximum weight capacity of 650 lbs. All parts are included and it's backed by a one-year limited warranty. PortaMate has been a pioneer in developing strong, sturdy mobile bases for woodworking and machine shop tools. It's no surprise that we're leading the pack with this 1500lb universal mobile base. It's an industrial strength, fully-adjustable rolling platform, with a capacity that exceeds the competition by hundreds of pounds. Like our other mobile bases, it increases and decreases in 1 inch increments, from 18.25 x 23.5 to 28 x 33.5. The all steel construction, solid corner brackets, casters and wheels (with foot control locking levers) ensure the strength and stability that you are looking for. The PM-3500 is ideal for all larger machines (like band saws, planers, jointers and many more) and is the perfect rolling base for cabinets, large tool boxes and anything else you need to make inch.mobile inch.. Everything needed is included. Earth Package with Composter Base Combo package for Compost bin,Rain barrels,compost thermometer, compost turner and compost bin plastic Mesh Bottom Base. Compost Happens "The Free Garden EARTH compost bin is an efficient, durable, and economical tool that saves money and provides many benefits for homeowners and gardeners. Manufactured of 100% recycled content, its single-unit main body construction means no difficult assembly, and no structural integrity issues over time or in extreme weather conditions. The animal and pest resistant lid twists for variable ventilation control, and covers a large 19.5 (49.5 cm)opening that offers easy, generous access to add material and maintain the pile. 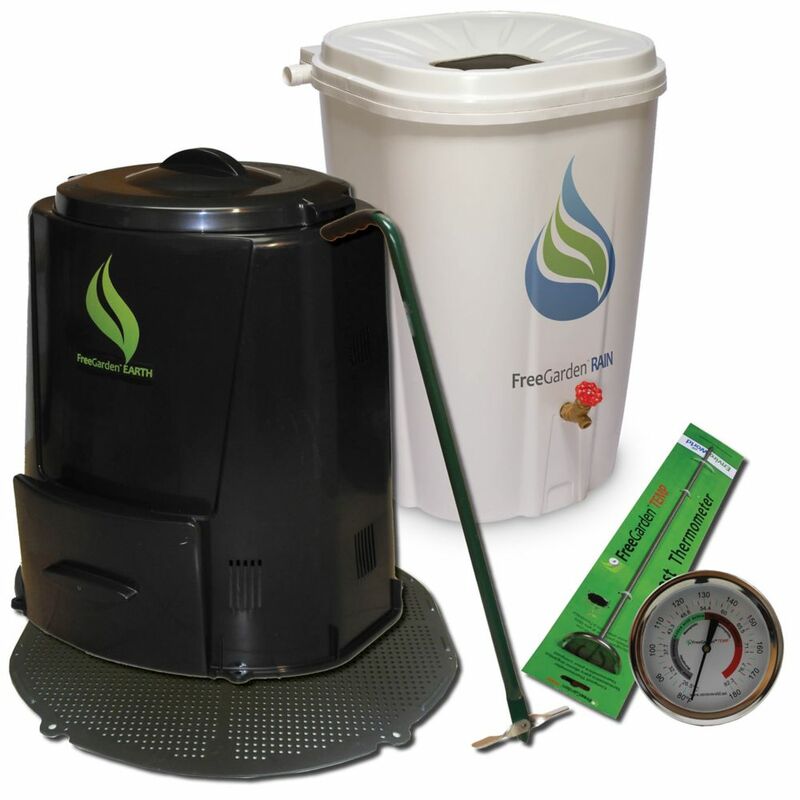 Earth Package with Composter Base is rated 5.0 out of 5 by 1.